17908 VAR FRANCE (French Legion against B (1942) Airplane flying over the Eiffel Tower. Michel No III. Michel listed variety III/V (catalogue value 800 DM): no accent on "E" of COURRIER SPECIAL. 10809 VAR FRANCE (1965) "The Red Violin"*. 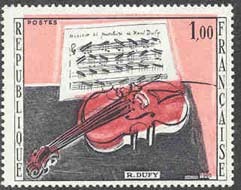 Variety with color red shifted up resulting in doubling of image of violin. Scott No 1117, Yvert No 1459.